Larry’s “She’s Wanted (In Three States)” is very well known on the Northern scene and has been “reissued” several times. But pleasant as that song is it’s not a patch on This Would Be My Prayer. In its simplicity and openness this is a quietly moving piece of music. 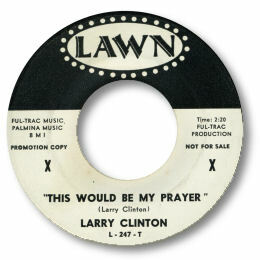 Larry is both convincing and impressive as he sings round the memorable hook with some fine gospel touches to his delivery. Sometimes these typically small studio productions hit the hardest. Cut in Philly.